Using advanced model railroad wiring techniques for automated train operation is another exciting aspect of this hobby. Imagine your passenger train traveling from town to town. As it approaches each station, the train slows down and then stops right in front of the station for loading and unloading passengers. After a certain amount of time goes by - perhaps 30-60 sec - the train slowly starts up again and then resumes its previous speed to get to the next town. If necessary it can be made to slow down when approaching certain curves or junctions as well - all without you having to lift a finger! Basically, all you have to do to accomplish these automated tasks is to isolate certain sections of track and wire circuit boards to the tracks that tell your trains what to do. The only other element you need is a position sensor to tell the circuit board when the train is approaching. For slow-down only, you will need the Circuitron AS-1 circuit board. One wire from the board goes to the powered rail on the isolated track and another wire from the board goes to the isolated rail. In this situation, when the train gets to the isolated section of track it slows down as it approaches the station. Then as it leaves the station and returns to the non-isolated track, it speeds up again. This works best if you use a locomotive with a flywheel that slows gradually and starts up gradually, for a more realistic operation. You won’t need a photocell for this operation. As the train gets to the isolated track it begins to slow down. When it reaches the photosensor at the station, it stops and stays there for a period of time that can be set on the circuit board. It then starts up again slowly. When it reaches the non-isolated track it speeds up again. You can also connect the other outputs on the DT-4 to activate additional effects. 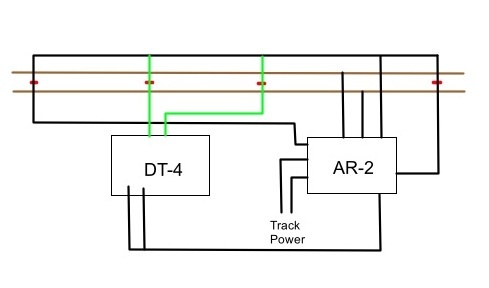 If you want the trolley to stop at each end of the track and be delayed for a set period of time, substitute an AR-2 circuit board for the AR-1. The above automated train operations are meant to be used for analog train systems only, not for DCC model railroad wiring. So, even without DCC, you can do some pretty fancy stuff with analog cab control and regular block wiring using the Circuitron circuit boards. 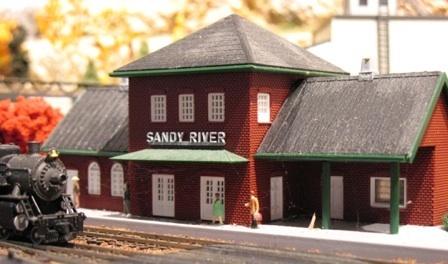 Creative Effects for Your Model Railroad by Paul Newitt. For a complete listing of all Circuitron circuit boards, check the website at circuitron.com where you can download the complete catalog as a pdf file. Many of these items are also available through the Walthers catalog. Also see the page on automatic turnout control using Reed switches. From "Model Railroad Wiring for Automated Train Operation" to "Special FX"
From "Model Railroad Wiring for Automated Train Operation" to "Homepage"